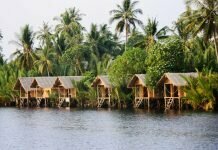 In the recent years, Cambodia has been known as a “beautiful, unique and cheap” tourist destination of Southeast Asia so the number of tourists coming this country to visit is also rapidly increasing. Those who want to immerse in nature and enjoy the slow pace of life and tranquility, Cambodia is one of the best suggestions. Here are some reasons why Cambodia should be on your bucket list. Angkor Wat is unmissable place to visit when traveling Cambodia. The temple is a historical relic of the old Khmer dynasty from the 9th to 15th centuries which is surrounded by a jungle. Angkor Wat is a typical example of the ancient Khmer architecture. Waking up early and watching the sunrise at Angkor Wat is an interesting experience you should not miss which brings you the feelings of both overwhelmed and peaceful. Besides Angkor Wat, this area also features many beautiful temples that you can take a week to visit all. Maybe Angkor Wat is the most famous site in Cambodia but many travelers said that they was really impressed with Ta Prohm which has been appeared in the hit movie “Lara Croft Tomb Raider”. If you are looking for a destination where having the tranquil and pristine beaches instead of crowded resorts, you should choose Cambodia. 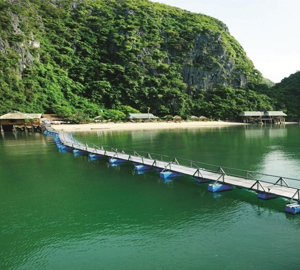 From Phnom Penh, you can go to Kep and take a boat to Rabbit Island. This small island has only a few tends and offers electricity 4 hours a day. If you want to visit a larger place, let’s go to Sihanoukville or take a speed boat to Koh Rong Island. The island is very quiet and beautiful with white sand and blue water. 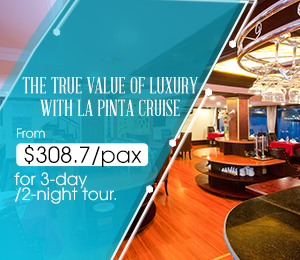 Coming here, you will be completely relaxed as if you are in a “real paradise”. Tonle Sap Lake is the largest and most important freshwater lake in Southeast Asia. The lake widens and changes dramatically every season. Tonle Sap brings a great source of seafood now is a popular tourist destination in Siem Reap province. Taking a boat tour on Tonle Sap is a must-do activity to sightseeing and discovering the daily life of locals in here. Cambodian street cuisine is delicious, varied and attractive. Anyone who comes to Cambodia will love to eat fried rice and fried noodles of this country. In addition, you also can have an opportunity to savor some weird food of locals like grilled spiders, crickets, etc. Bamboo train is a very interesting “specialty” of Battambang. It is also the main and cheap mean of transportation of this province. A sightseeing tour with bamboo train only costs about 8 USD so those who love adventure and immerse in nature should try this experience. Cambodian people are very friendly and always welcome foreign tourists. Cambodia is a peaceful country, so people in here are also so gently. They always smile and ready to take pictures with you if you want. Even if you are female and traveling alone, Cambodia still brings the feelings of peace and safety. You will not have to worry about scams or theft. 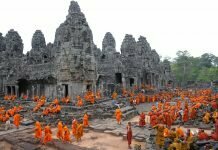 Cambodia is an ideal place for you if you want to travel to a country offering both nice landscape and cheap expenses. You do not need to spend a lot of money but still can travel abroad. Budget-minded travelers can stay in tidy, charming accommodations and eat three delicious meals for roughly $25 per day. So when you factor in the country’s vibrant culture, breathtaking historic sites, natural wonders, smiling faces, and ridiculously low prices, it’s a tough travel destination to resist. 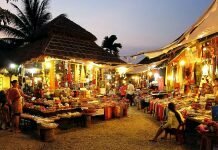 Read more Cambodia travel guides, please visit our website. For questions or suggestions, please feel free to let us know in the comments section and we’ll do our best to reply to them as soon as possible. You can also share this article if you like it!